A fascinating thriller, Blessed: The Prodigal Daughter by A.L. Bryant features an unusually gifted protagonist, Glory. Set in 2021, the narrative follows Glory, who finds herself stabbed multiple times and left for dead. No one in St. Ann’s Hospital thought she could live through the night, but to their utter surprise, she healed quicker than anyone they’d ever seen. She suffered memory loss with no recollection of the attack that almost ended her life, but there is more to her than her ability to heal. While the hospital wants to use her case for research, Glory wants to know who she really is and how she developed such extraordinary powers. Little does she know that she is a piece in a chess game between two shadowy organizations. NYPD Detective Dennis Wilson gets involved when casualties ensue, resulting from the fray between the fight for control by the two organizations. He gets enmeshed in the case when his investigation leads to a painful tragedy and when he becomes the hunted, he turns to the least expected person for help. A.L. Bryant has crafted a book for fans of thrillers. The narrative begins with a very intriguing premise, a woman gravely wounded and barely conscious of her situation, left in the gutter: “Her body lay half submerged in a puddle of murky liquid. She could not feel the cold water that soaked her clothes and hair, nor the ravenous assault of the alley rats; from where she lay under the fire escape, she could only see them reflected in the enormous piece of glass hanging from one rusty bar.” The author’s ability to capture images, emotions, and to create scenes that are focused caught my attention right from the start of the story. A.L. Bryant has a unique skill for character development and readers will be intrigued by Glory and her journey to self-discovery and awareness. 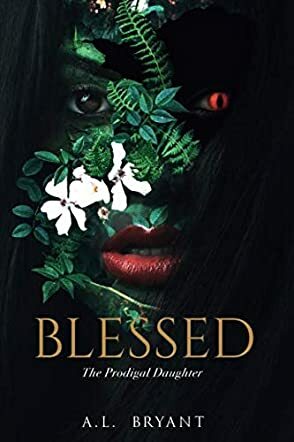 Blessed: The Prodigal Daughter has the kind of delightful prose that makes a story enjoyable, the suspense is skillfully designed and the story so cunningly plotted it becomes irresistible. Blessed: The Prodigal Daughter by A.L. Bryant starts with a nurse’s premonition that tells her something big is about to happen that night, New Year’s Day 2022 in Manhattan New York. Enter Glory, who comes into a busy hospital looking like death herself: filthy, covered in blood, and unresponsive to the nurses and doctors who flit around her. Because of her critical condition, it was expected she wouldn’t survive. So imagine the hospital staff’s surprise when their dying patient takes matters into her own hands and revives herself. In another part of Manhattan is a certain Detective Dennis Wilson, a jaded NYPD cop. He is the best at his job but with a nonchalant acceptance of his superiority he seems conceited to others. His adeptness at his job has more to do with his almost obsessive fixation and curiosity on his cases, but what if this fixation makes him a target, and endangers his work, his life, and his loved ones? For me, A.L. Bryant’s Blessed: The Prodigal Daughter has all the ingredients to keep readers turning the pages. It introduces a supernatural being, Glory, into a circle of people who are used to having a medical explanation for everything. Bryant highlights the challenges Glory faces as she is treated differently because of what she is, and add to that her confusion because of her lost memories. I also admired Detective Dennis, who may seem rough but cares more than you think, and his dedication and single-minded focus in solving his cases. This story introduces an array of plot twists which I would eagerly follow on to the next book. A.L. Bryant’s skill in storytelling makes smooth transitions to the different points of view of different characters. I love books with so many unexpected elements that keep me guessing until the end, and this book delivers on that and so much more. This is truly a unique, intriguing story with a lot of layers and complexity I can’t wait to unravel. When two bodies are found, Detective Dennis Wilson’s pursuit of the murderer becomes even more relentless. His search is fuelled by the fact that the deceased are two of his best friends. Before the findings, a pattern of murders has been going on and Wilson is determined to stop the killer. Meanwhile, Dr. Stephens witnesses a phenomenon he has never come across before; a body healing itself without the need for medical intervention. Glory had come into the hospital having suffered multiple stabbings. It surprises the doctor that she was even able to arrive at the hospital in the first place. As the plot in Blessed: The Prodigal Daughter by A.L. Bryant progresses, secret organizations are exposed and the characters are caught up in the conflict between two deadly groups. Blessed: The Prodigal Daughter by A.L. Bryant explores various thrilling and entertaining subplots. The different strands are held together by a brewing conflict between two powerful and death-dealing groups and the maniac behind the conflict has been known to go to horrific extremes to get what he wants. This thriller combines aspects of the physical and the supernatural to present a hair-raising story. Glory has special capabilities and the book also includes many supernatural scenes which make it even more thrilling. The characters have different lives and each is connected to the conflict in some way. Some of them will lose their lives as the fight continues. A.L. Bryant’s Blessed is suspenseful and gripping in many ways. A science and faith thriller! Suspenseful, captivating to the end; intriguing characters who lead you to ask your own questions about the use of science for people of faith. Excellently written. Can't wait for the companion book. Highly recommended.